It’s rare in Jazz music to see a trombone player in the role of band leader. Some of the greatest and most remembered names in Jazz among the vast majority of Americans include: Louis Armstrong, Dizzy Gillespie, Charlie Parker, Benny Goodman, Billie Holiday, Sonny Rollins, Herbie Hancock, Miles Davis, and Thelonious Monk. None of those players ever once led a band with trombone in hand. 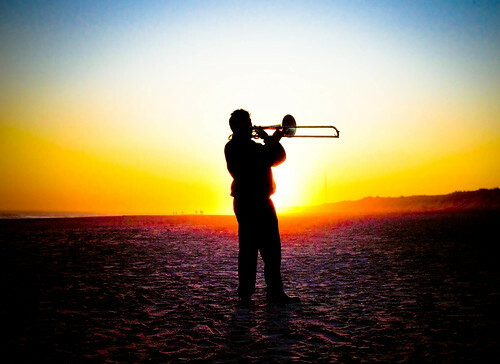 While there are notable Jazz greats who played the slide trombone while commanding a room and conducting a band, it still remains common place to have a trumpet be the focal point. Big Sam leads on trombone. Big Sam was always a big boy. In the 6th grade, he was 6 foot tall and 200 pounds while playing little league basketball. When the time came that he grew out of playing the sport – literally – Sam approached his school’s band leader and asked him what instrument they needed someone to play. “What’s that?” Sam said. That’s all it took to hook him.